-Do you hate driving at night, hazy or rainy days? 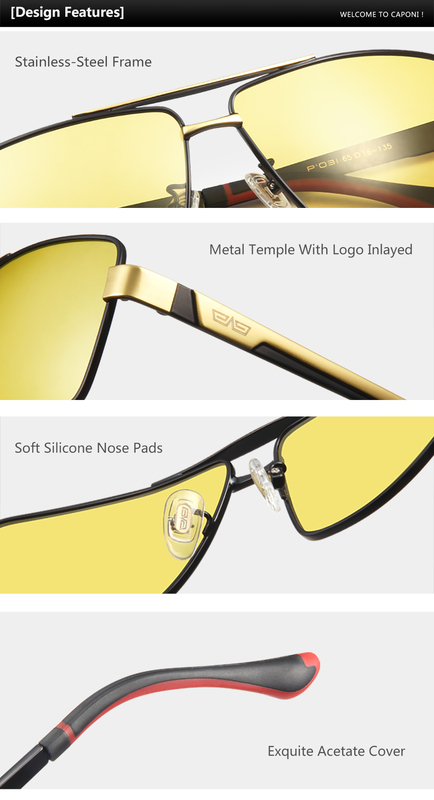 -Are you an athlete or into outdoor activities that require eye protection, safety, and vision enhancements? -Tired of wasting your hard earned money by ignorantly buying substandard quality night driving glasses that end up turning into a huge disappointment? Introducing the Night Vision Square Glasses. An excellent way to stay safe behind the wheels and provides a crystal clear night vision for your eyes! Polarized lenses can remove the effects of glare by blocking reflections. This improves eye comfort and allows you to take in the view without squinting. Our AR coatings can virtually eliminate the reflection of light from eyeglass lenses, allowing 99.5 percent of available light to pass through the lenses and enter the eye for good vision. The hard coating makes the surface more resistant to scratches and therefore increases the durability of the lens. Spring Hinges (“flex hinges”) provide greater comfort for the wearer and is able to withstand everyday use. Due to their snug fit, Spring Hinge frames are more likely to stay on while running or jogging, which makes them a good choice for people with an active lifestyle.